Let’s talk more about people. Imagine if you want to introduce someone to a friend. How would you describe them? What words would you use? Think you are ready? Jump to the Quiz. Your older sister has long hair. My mother has short hair. N5 offers up a handful of words that you can use to describe one’s personality – つまらない, おもしろい, and いそがしい. My friend is a fun/interesting person. The best translation for おもしろい is interesting, but ‘interesting’ has a pretty wide meaning in English. The Japanese word おもしろい tends to lean toward ‘fun’ as someone that does interesting things. こわいい on the other hand is focused more on being cute. Your little niece is こわいい or a puppy is こわいい, but not a grown woman. Are (you) full of energy? My older brother lives in Osaka. My younger brother works at ABC Company. 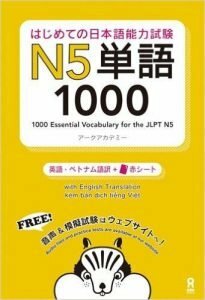 JEES has made the official JLPT N5 Workbook available for download free. The N5 workbook is pretty close to the same size as the real test and the questions are made up of questions from previous exams. Also it is free, so if you have the time, be sure to download it and give it a try. A subscription to the JLPT Boot Camp Courses site includes a complete guide to studying and preparing for the JLPT as well as a complete grammar guide for N5. The grammar guide includes tips and common mistakes to look out for when taking the test. Each chapter includes a video explanation, clear grammar explanations, several example sentences, and JLPT-style questions. Sign up today and get started on the right path. Ask Publishing is well-known for their books on the N5. This is a pretty straightforward vocabulary study book that covers all the essential vocabulary that you’ll need to learn in order to pass the test. I like how this book offers check boxes to help you chart your progress as well as clear sentences to help you understand every word.